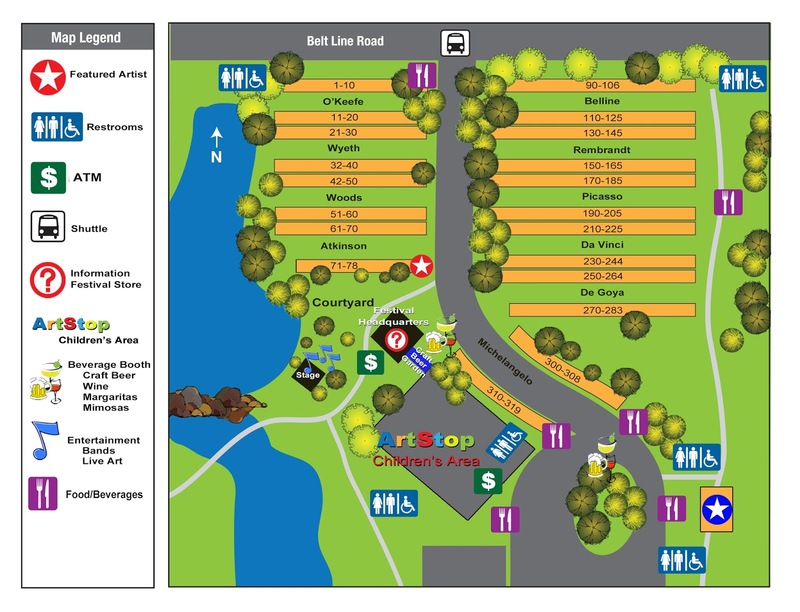 Cottonwood Art Festival is currently accepting applications for the Spring 2018 show scheduled for May 5-6 in the beautiful Cottonwood Park located in Richardson, Texas. The online form is available through ZAPP and the deadline to submit is January 12, 2018 at midnight and the non-refundable application fee is $30 per category. Artist may submit up to two different applications and must include a photo of their booth set-up along with photos of the work to be exhibited. Sponsored by the City of Richardson, Cottonwood Art Festival showcases an extensive variety of fine art by artists from around the world. The semi-annual award-winning festival celebrates the 49th anniversary in 2018 and maintains the tradition of free admission and free parking for the entire weekend. Five images are required for each application and four of the images must be of individual pieces. The fifth image must be a booth image displaying the current body of work. If a booth shot is not available, the artist should submit an image of a grouping of works which represents the work to be shown. Any work outside of the medium submitted that appears in the booth shot will not be considered accepted by the jury, due to its mere presence in the booth image. Approximately 240 artists will be invited to exhibit May 5-6, 2018 at Cottonwood Art Festival. Each artist is determined through a competitive jury process and scored by jury members on a scale of yes-no-maybe in the first round, creating a ranked group of artists in each category deemed qualified to advance to the second round. Scoring for the second round is on a 1 - 7 scale. A third and final round encourages discussion and then jurors have the choice of revising their scores and final scores are recorded. The top scorers in each category receive an invitation to the show. The jury dates are set for January 17-19, 2018. An additional number of artists are retained for the waiting list of alternates and based upon the scores received in their category. The director of the show has the right to invite up to, but not to exceed, 10 artists at her discretion. Notifications to artists will be sent on January 29, 2018. Artists are provided with an approximate 13' x 13' space and booth fees are due February 16, 2018. Upon receipt of an acceptance the selected artist is required to pay the deposit. Single booth fee is $475 and the double booth fee is $850 (limited to only one per aisle and on first-received basis). Electricity (400 watt) is optional, may be added for $80, and must be purchased with the booth fee. Artists may cancel by March 9, 2018 to receive a 50% refund less $25 administrative fee. No refunds will be given after March 9, 2018. Check-in begins on Thursday, May 3, 2018 from Noon - 7:00 p.m. and continues on Friday, May 4, 2018 from 9:00 a.m. until 10:00 p.m. All artists receive a festival t-shirt, hospitality area with morning and afternoon snacks, chilled water and private restrooms. A reception featuring a catered dinner and live entertainment will be on Friday, May 4, 2018. Booth sitting is provided throughout the festival hours and Boy Scout Troops assist with artist set-up and take-down. The festival provides 24-hour security and police patrol. Artists may inquire for special rates at the designated host hotel to book advance accommodations within the area. The complete details of requirements and application terms are listed: https://www.zapplication.org/event-info.php?ID=5781.